Based on the Jedi Starfighter from "Revenge of the Sith". Different color fighters for different states. See preview. Enjoy! May the Force be with you! You really have made some clever cursors lately. Yes. And proud of it. Geek is the new cool. ...And Cool is the new Geek! Cheers! Yeah, I don't really have the patience for alot of animation... plus, I think too much on a cursor is kinda distracting. Thanks! Well, I'm a certified geek, so I give this one a big ol' of approval!!! thanks Jinny.. I'm a big geek too. I love it!! My favourite film is "Star Wars"!! It's great and it's a great idea. You must coninue making those things. 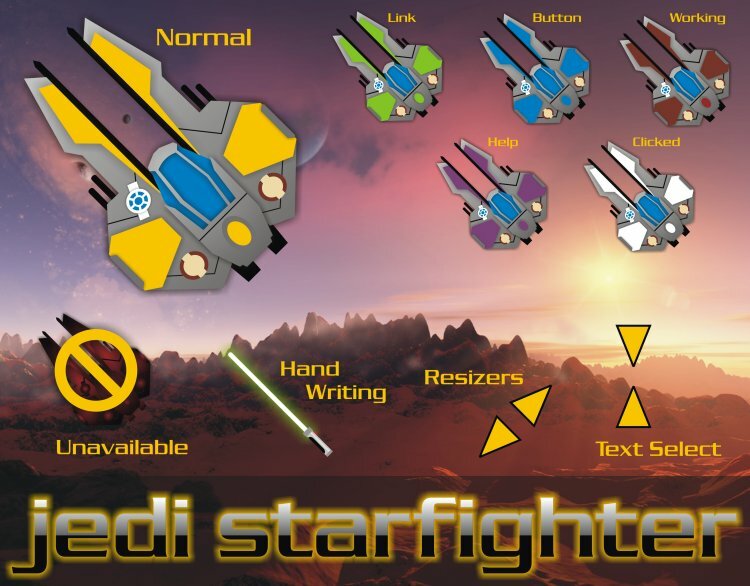 � �Do you have one with the Jedi Starfighter from Episode II? If not one would be cool. Say, this is just what I've been looking for! (I have a star wars theme on my PC)Thanks!